‘Comfort read’ is a term much maligned in the book reviewing world. It conjurers up images of ‘cosy’ books with settings far removed from the realities of everyday life. But a recent post by Reactions to Reading discussed some of the series that have had a long-standing place in the reviewer’s affections. And we all have them. The books of the late, great Tony Hillerman were a massive comfort read for me and I still read them, even though I know there won’t be any more written. And there was nothing ‘cosy’ about his books. A modern writer whose series is fast becoming a favourite is Elly Griffiths. Set in Norfolk, her books feature forensic archaeologist Ruth Galloway who is now a single mother after her short-lived affair with DCI Harry Nelson. 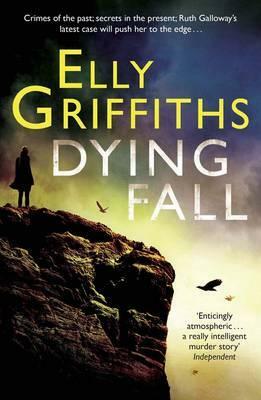 In Dying Fall, the setting moves to the North West of England, my old stomping ground and it was great to read the now familiar cast of characters in a new setting. Daniel Golding, an old university friend of Ruth, burns to death in a house fire. Ruth is surprised to hear that her once ambitious and charismatic friend has been languishing in a small university near Pendle in the north of England. Days after his death, she receives a letter from him telling her of a discovery he has made involving the ancient ‘Raven King’ and urging her to get involved. Ruth decides to go north, taking her daughter Kate and accompanied by Cathbad, her druid friend. DCI Nelson has also decided to take a holiday to his home town of Blackpool where he calls on an old police colleague to see how the investigation is progressing. Police are now treating the death as suspicious and a member of a far-right white supremacist group is thought to be the most likely suspect. The change of scenery worked well, although I think part of the enjoyment was recognising many of places including Pendle Hill, Lytham and Blackpool. For me, the attraction of the series is that the character of Ruth Galloway and I are about the same age. So the cultural references to the 80s and 90s are spot on, and I can recognise the surprise you feel at successful friends at university who have failed to live up to their promise while others have taken a different path in life. The murder investigation was enjoyable although I wasn’t that engaged in the far-right aspect of the case. There might be people looking to hark back to the days of King Arthur but in my experience racist groups tend to be far less articulate than that. The characters though, as ever, were an absolute delight and there was a heart-stopping moment towards the end when I thought I was about to lose one of my favourites. This series just keeps getting better and better and, for me, the next book can’t come around soon enough. Oh that WAS a heart stopping moment Sarah – I was quite cross with Griffiths for giving me that particular scare. I identify with some of Ruth’s life as well being a similar age and all. Though I did have a chuckle when she mentioned that she didn’t like being called by her first name unless she’d given permission – that’s a very English thing I think – it’s very rare for anyone in Oz to use anything but first names regardless of the circumstances. I wonder if it’s to do with the fact she’s a doctor. I know some academics who having worked hard for their PhDs like it to be acknowledged when being addressed in a professional context. This is especially the case for women, although I can’t remember that bit in the book to be honest. I was on tenterhooks near the end as well! I do really enjoy Elly’s writing and yes I’m of that kind of age as well! Glad you enjoyed the book overall and many thanks for the mention. Thanks – and I’m sure you enjoyed all those Raven images in the book! I’m looking forward to catching up with this series – happy to know this is another keeper. Sarah – A terrific review as ever. This is indeed one of those series that keeps getting better and better. I think one of the things I like best about it is the set of characters and their interactions. But there’s no denying that the setting just draws you in. No wonder you were able to connect so well with this one being set in the north west of England if you’ve lived there. I was slightly concerned how it would work, removing characters from their familiar setting, but as you can tell, I liked it. Alright: this series is moving to the top of my TBR. Hi – yes it is. I prefer not to read in this tense but for Griffiths (and a couple of others) I make an exception. I love it when you review an author I already know I want to read… and motivate me to move the books up on my list. This is another series my husband has read (at least the first two), although I found them for him and did not even think he would like them. I was very wrong. Anyway, great review. My only comfort read (off the top of my head) is Rex Stout and I have reread those so many times I have them memorized. Although I could easily reread the early Jane Haddam books if I had the time. And I have been thinking of rereading the Jill McGown books (Lloyd and Hill series). Thanks Tracy and interesting that your husband likes the books too. They are a nice mix of domestic/relationship detail with interesting plots. I haven’t read any of your comfort reads but have mentally noted them in case I see any of the authors. I love Ruth Galloway and can’t wait for this book to hit the library. I put it on hold as soon as I knew it was out. I like her character even more than the plots, her internal thinking, her friends, her family and the dynamics about them. Glad you wrote up a review here. Yes, Elly Griffith’s books are among my comfort reads, where I go to my favorite reading spot with tea and a snack and curl up ready to go. This winter when I wanted to just read “comfort” reads for awhile, I read Rex Stout’s Nero Wolfe books, some in the Precious Ramotswe series by Alexander McCall Smith, and a Russell Quant book by Anthony Bidulka. I feel this way about Kerry Greenwood’s Corinna Chapman books, Sara Paretsky’s V.I. Warshawski series, Sue Grafton’s Kinsey Milhone books, Donna Leon’s Guido Brunetti books and the indomitable Salvo Montalbano of the Vigata, Sicily police as written by that mischievous Andrea Camilleri. Glad you like the series too Kathy. Do come back and let me know what you think of the book when you’ve read it. And another Nero Wolfe fan. I’ve not read a single book by Rex Stout but I’m going to try and track one down. Sue Grafton would be a comfort read for me too along with Jonathan Kellerman. I must push this series up my TBR list – the local references are too good to pass over. For me a comfort read is something that you can pick up when you’re in a bad mood and lose yourself in easily, to forget what’s been stressing you out. I agree that it doesn’t have to be ‘cosy’. I count a number of crime series among my comfort reads! Hi Marie – yes I think you’ll enjoy the local references too! I’m so glad you liked it too – they’ve never failed me yet. I can remember when I read the first one, I bought the 2nd one straight away – but ever since I have had to wait impatiently for the next one. I love the character of Ruth, and I love the Norfolk setting. It’s made me want to visit there. I grew up in Liverpool, so the Blackpool and Lancs setting of this one was somewhat familiar too, that’s where we scallys went for days out! Did you read the special Christmas short story available on Kindle? I loved that, too. Hi Moira – glad to meet another fan of the series. I haven’t downloaded the short story yet but I intend to thanks!